How do I Add Songs to iTunes from my Computer? On the welcome screen, click "Not In iTunes"
All of the tracks which are on your computer hard drive, but missing from your iTunes will be displayed. Click "Add All Tracks to iTunes"
Tune Sweeper is able to scan your local hard drive and detect any tracks which are not currently in your iTunes library. It will then be able to add the detected tracks into your iTunes library for you. To see which tracks that are on your local hard drive but not in your iTunes library, select the 'Not in iTunes' tab at the top of Tune Sweeper. Tune Sweeper will automatically perform the scan for you once the tab is selected. 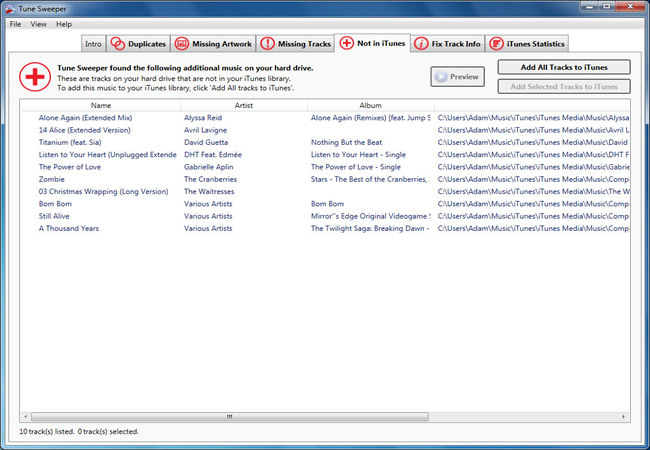 Once Tune Sweeper has scanned your local hard drive, it will display all of the tracks not in iTunes in a single list. You can preview each track before deciding whether or not to add them into iTunes. Simply select the track you want to hear by clicking on it and then click the 'Preview' button. Alternatively, double click on the track in the list to start the preview. The track will stop playing if you change the track selection in the list, if you click the 'Preview' button again or if the track finishes playing. You can add all of the listed tracks to iTunes by selecting the 'Add All Tracks to iTunes' button in the top right corner above where the tracks are listed. Alternatively you can select individual tracks to add to iTunes and select the 'Add Selected Tracks to iTunes' button located directly below the 'Add All Tracks to iTunes' button. A grey tick will appear next to all of the tracks which were successfully added to iTunes.